This is one of my personal favorite soups, I used to make homemade bread bowls to serve it in… but times have changed and we try really hard to avoid those extra carbs. (But, it’s absolutely delicious that way!) It’s the perfect meal to make when Kenny brings fresh cut broccoli and cauliflower inside. Hope you enjoy as much as we do. Melt the butter in a large stock pot over medium heat. Add the onions, celery, red pepper, carrots and garlic. Sautee until soft, about 6 minutes. Add chicken broth and broccoli and cauliflower. Bring to a boil, reduce heat to a simmer. Season with salt, pepper, and cover, simmering for 15 minutes. Meanwhile, make the cheese sauce. In a small pot, melt butter over medium-high heat. Add flour to butter and stir until a thick paste forms. Add milk a little at a time, stirring completely after each addition. When all milk is incorporated, allow mixture to heat to bubbling, stirring frequently. Keep an eye on it – don’t walk away. When the mixture is nice and thick and hot. Begin adding the cheese, about one cup at a time (don’t measure it, just throw in a handful), stirring continuously. When the cheese is melted, remove pot from heat. 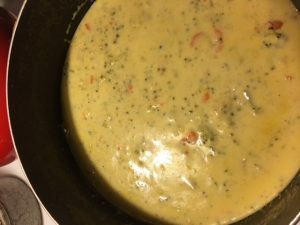 Add cheese sauce to the soup and stir until completely incorporated. Taste, and adjust the salt and pepper if necessary.